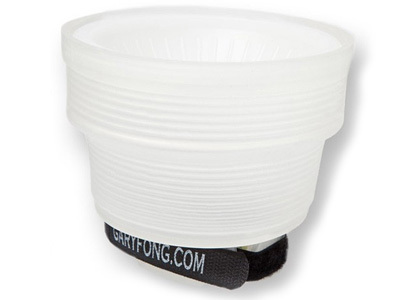 The Gary Fong Lightsphere Collapsible with Speed Mount diffuses the light from your on-camera shoe-mounted flash unit. It features a strap with hook-and-loop fasteners for quickly attaching and removing the diffuser. Also, its collapsible design means that it can be easily stored for travel. This diffuser comes with a White Dome for extra diffusion which can be inverted for a different effect. This dome can be removed or replaced with additional colours. The Lightsphere can also use an optional gel system for even more creative options.